Here’s the box Saber Lily was shipped in. 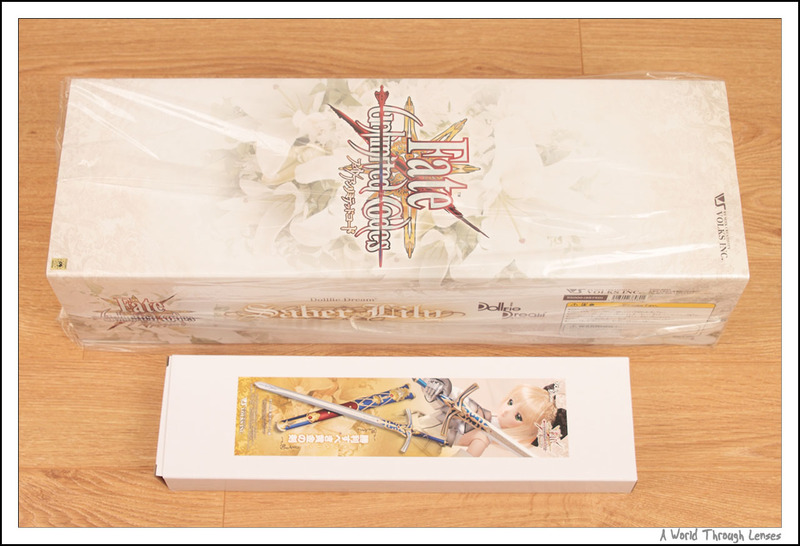 The big box contains the doll, clothes and the armor pieces and the smaller box contains her sword Caliburn. 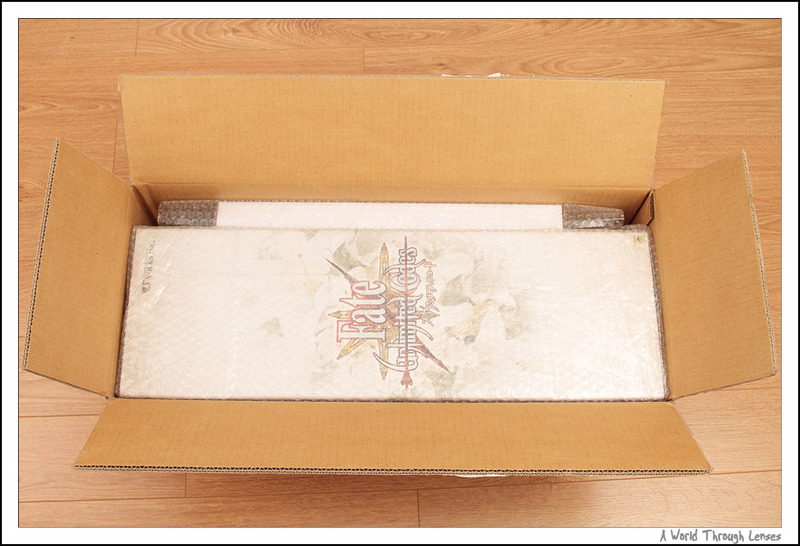 Volks International shipped the doll and the sword together with a bit of bubble wrap to “protect” them. Now EMS shipping to North America typically gets reasonable treatment, but I wonder how well it failed when the package is shipping to other countries with less courteous postal workers. 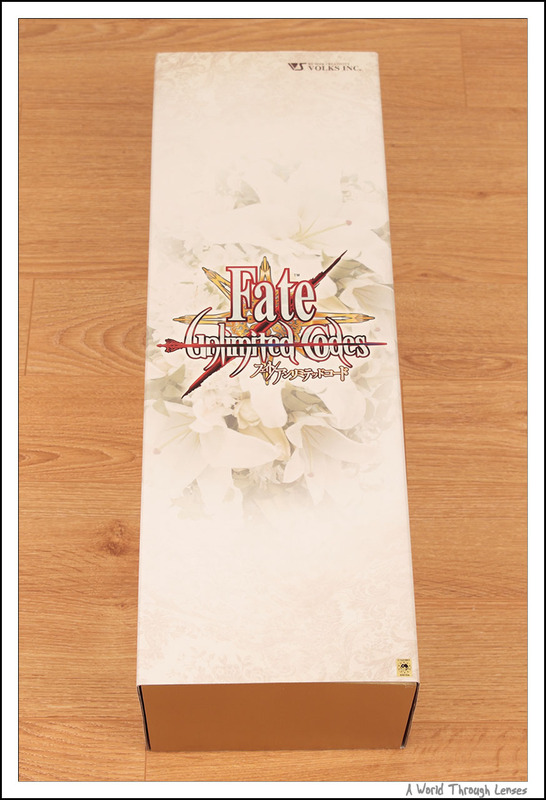 While Dollfie Dream Saber’s box is black, Saber Lily’s box is all white. 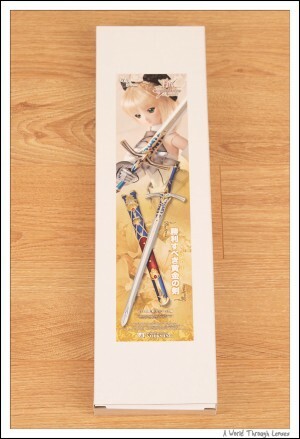 Dollfie dream Saber is secured on a protective soft pillow like those used in Volks’ Super Dollfies. 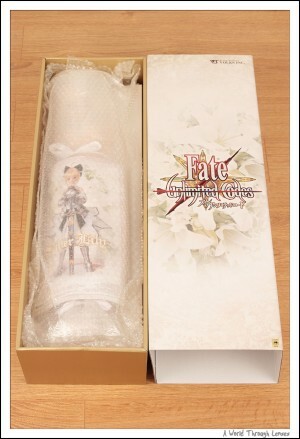 Saber Lily doesn’t have such a good treatment, the doll is simply protected by some bubble wraps. And here we are after removing all those bubble wraps. A closer look of Saber Lily in her pristine condition before I open her up. All the other items for the dolls are stashed right under the doll. Here’s everything else that with Saber Lily: wig, shoes, clothes and armor pieces. 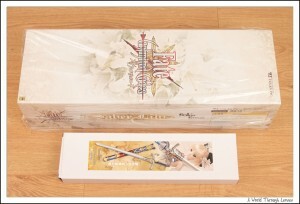 Her sword Caliburn is shipped separately in a smaller box. It is also wrapped in some bubble wraps. I’ve also got the Ever-Distant Utopia Avalon. Now I begin to put the doll together. As usual, I put the clothes on first starting with the undergarment then the dress, and finally the armor pieces. I always leave the wig to the last since this way it doesn’t mess up the hair as much. And that’s when things went wrong. As soon as I put the wigs on, I notices that the pony tail simply fell off. Here’s what it looks like. 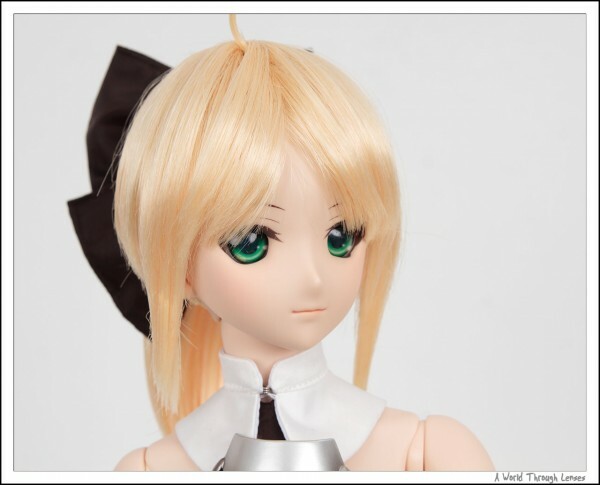 So Saber Lily’s wig is simply tied together with strings and then cut to be a short stub. Then without any other mean of securing the wig, a pony tail hair net is tied on top of that stub. Below is what my broken wig looks like taken by my poor quality iPhone camera. I emailed Volks about the wig issue the very day I received Saber Lily and they replied 2 days later indicating that they are sending me a replacement wig. 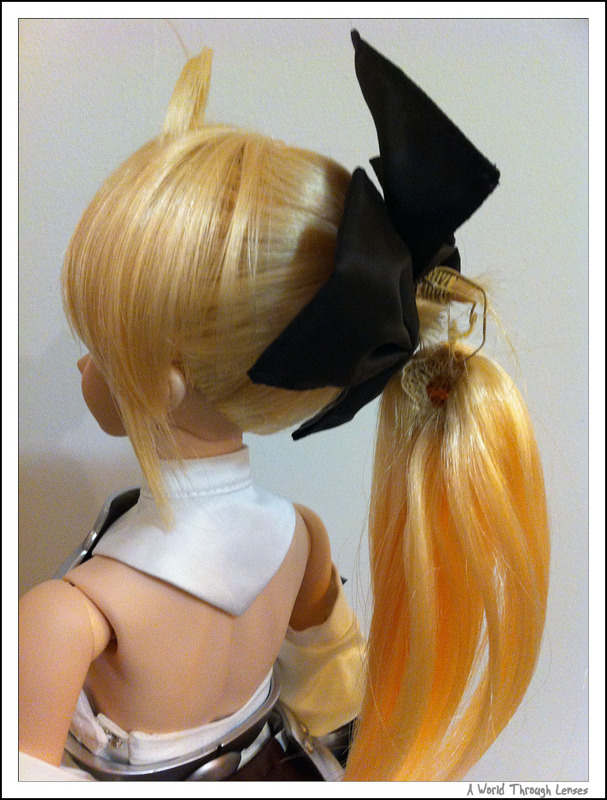 While waiting for the replacement wig to come, I actually came up with a method of repair it. The problem with the design of Saber Lily’s wig is that the hair tied together to form the short stub for the pony tail is way too short. So the string can easily lose grip and then the stub just falls apart and then the pony tail will just fall off. So to fix that, I tied the hair that forms the stub together again, just temporarily so doesn’t have to tie it that hard. Then using hot glue, I glued the hair that forms that short stub together. Once the glue cools, the stub now is formed permanently and will not get lose that easily. In fact, now I can untie the string and the ends of hairs are still glue together. Now I tie the stub together again, this harder and closer to the base. Then I put the ribbons back around the stub and then while stretching the hair net on the pony tail a bit, I put the pony tail back onto the now glued together stub. This actually fixed the problem reasonably well. Not to mention now I don’t have to worry about the pony tail any more, even pulling on it won’t damage the wig, at the worst, I just push the pony tail back up on the stub again. I don’t know why Volks doesn’t glue the hair stub and then pony tail in place, seems to me that a bit of blue provides much better security for the wig than the way it is right now. 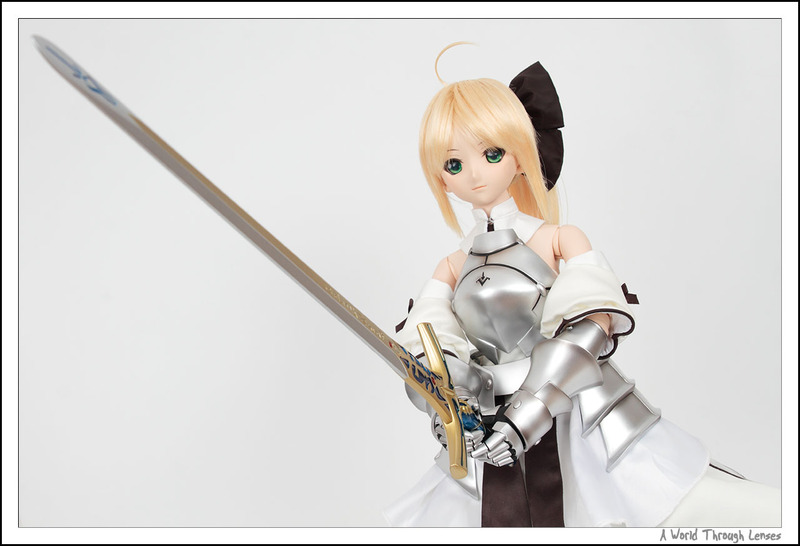 All Saber Lily owners, please be very careful with the pony tail. Try never touch the pony tail part of the wig when putting the wig on or off. Otherwise, who know if Volks will help you with your broken wig after some time. Okay, now a week later, I finally got my replacement wig in the mail. So finally I can continue my unboxing effort. And hence, now it’s unboxing round 2. 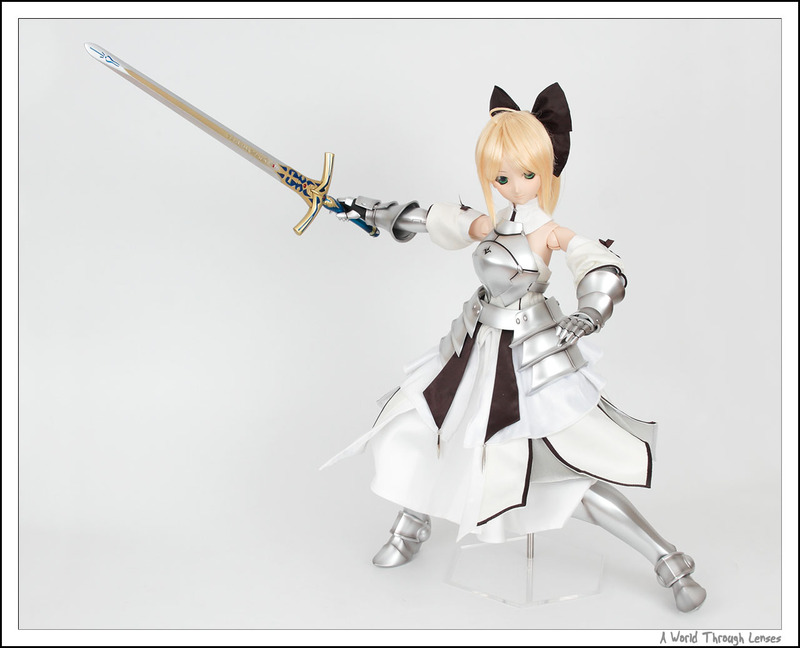 Here’s Saber Lily full appearance with all her clothes, armor pieces and swords. And here’s a closeup of her head. 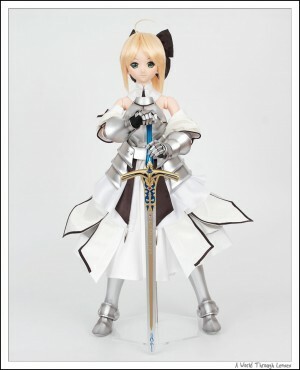 This is a different head mold than the original Saber and the later Saber Alter. The eye color is a bit brighter too. 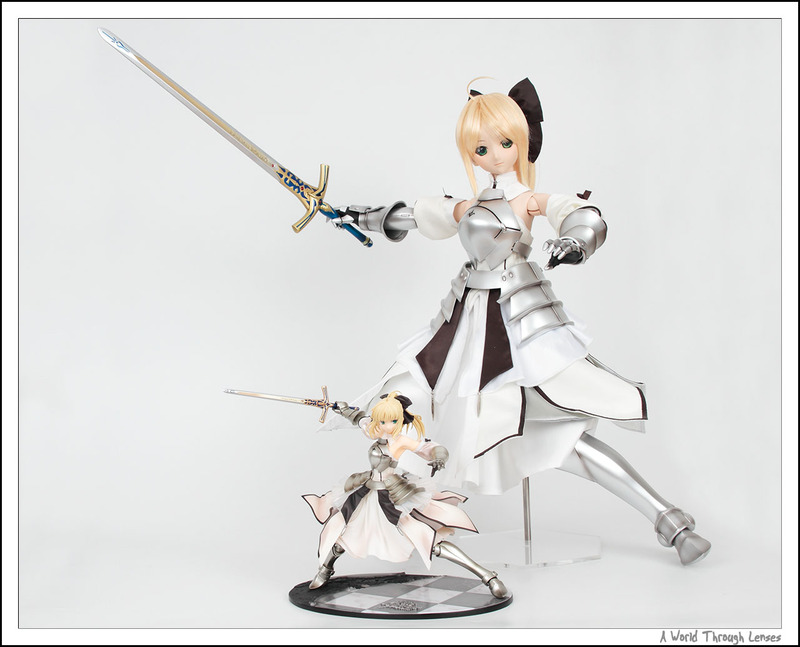 I will be doing some comparisons of the original Saber and Saber Lily in the future. Another shot form the side. There are three gauntlet part. Two is the standard left/right hand. 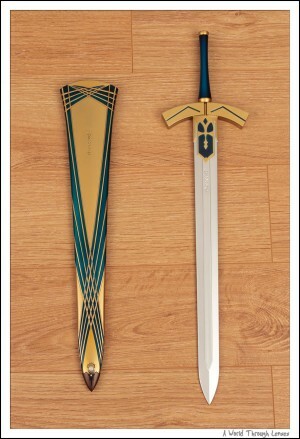 And there’s one that’s specially for holding the sword. 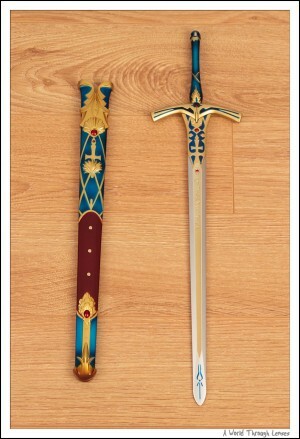 The sword has a small red piece that can be removed to reveal a hole. There is a small stub in the palm of the hand that allow Saber Lily to carry the sword like this. 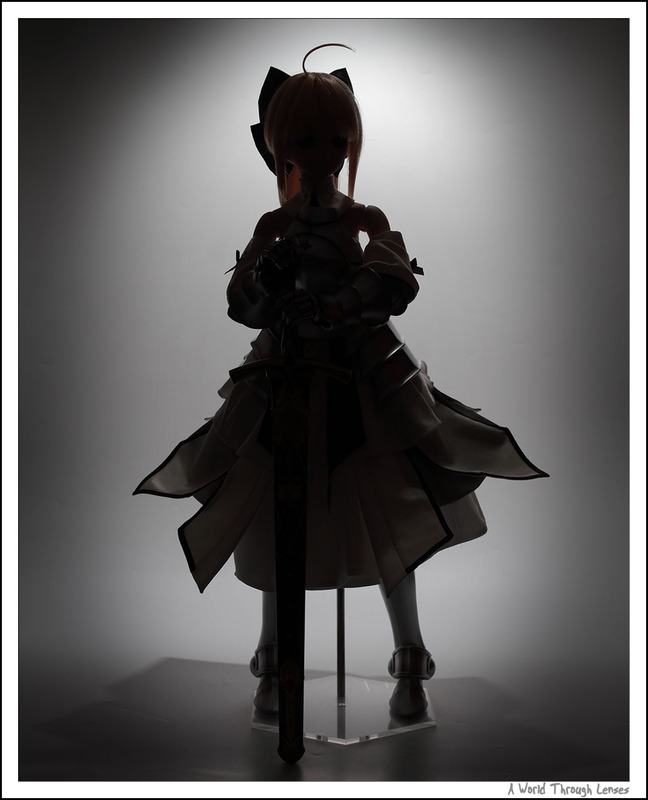 Saber Lily ready to unsheath the sword. 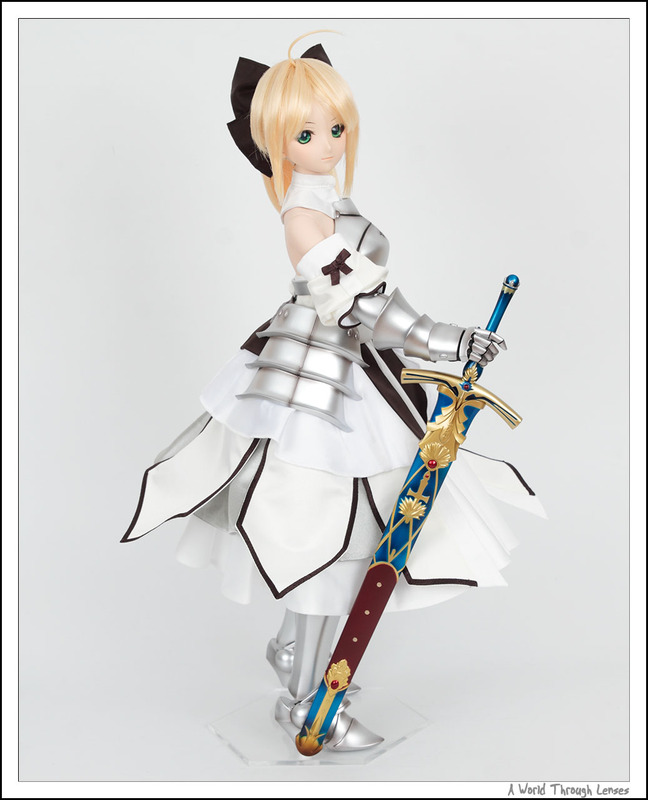 Saber Lily is still using the same Dollfie Dream Base Body II. So the load holding capacity of her joints are still very weak. It is very difficult to get her to hold that giant sword up like this without it falls down as soon as you let your finger go. 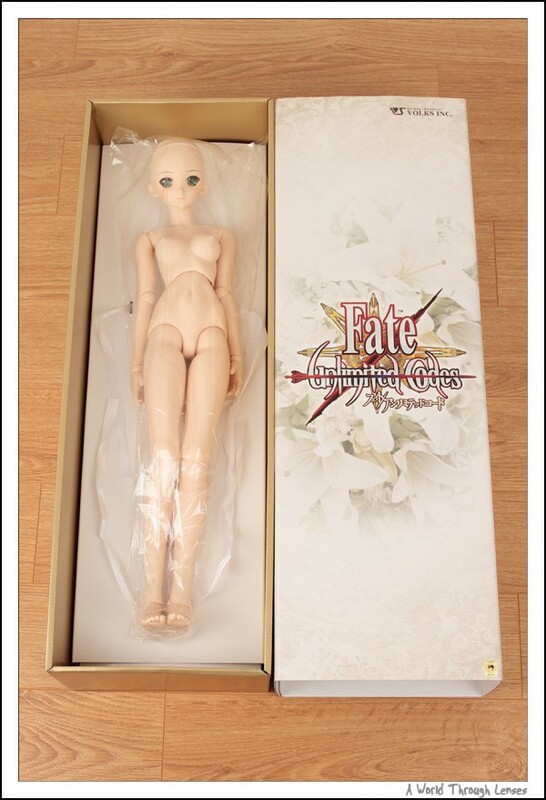 The new Dollfie Dream Sister is suppose to have better load holding capabilities. 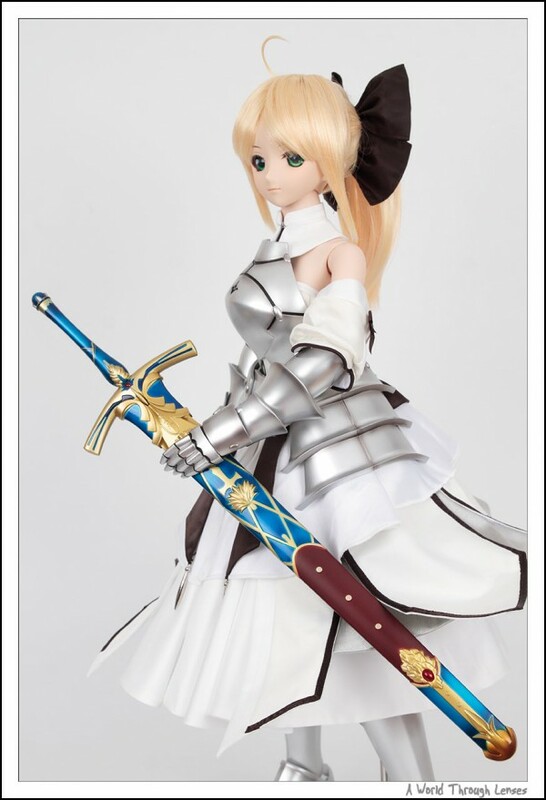 I can’t wait for my DDS Marisa to ship from Volks so I can test it out. A few shots with Saber Lily holding just the Caliburn with out the sheath. Holding the Caliburn with two hands was barely enough to keep the sword from falling down. 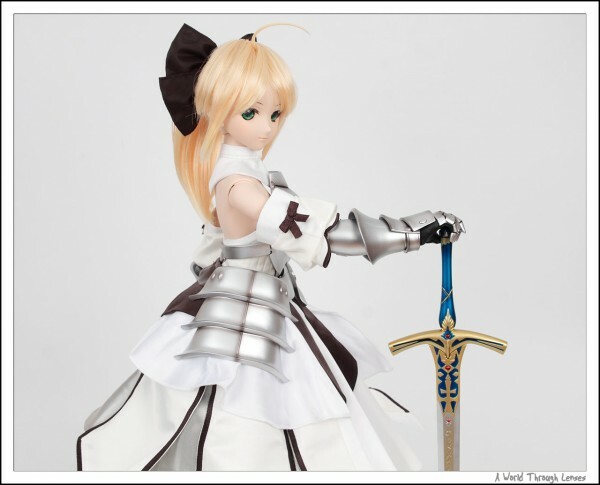 I was trying to get Saber Lily to strike a similar pose as my Saber Lily ~Distant Avalon~ PVC. But it was very difficult. I had to hold the tip of the Caliburn up with fishing wires, and the internal structure of the Dollfie Dream body still wasn’t flexible enough for me to pose her in a similar pose. So in the end this is my best attempt. I’m hoping with the release of Dollfie Dream Sister, the flexibility of the body will be improved for better poses. Here it is Dollfie Dream Saber Lily together with 1/7 scaled Saber Lily ~Distant Avalon~ PVC by Good Smile Company. 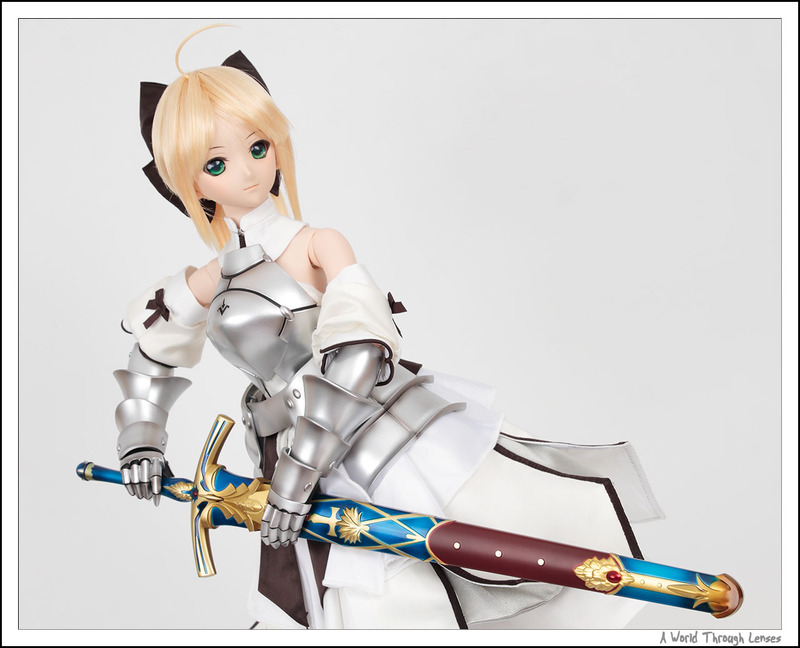 I will end this post with a close-up shot of Saber Lily. 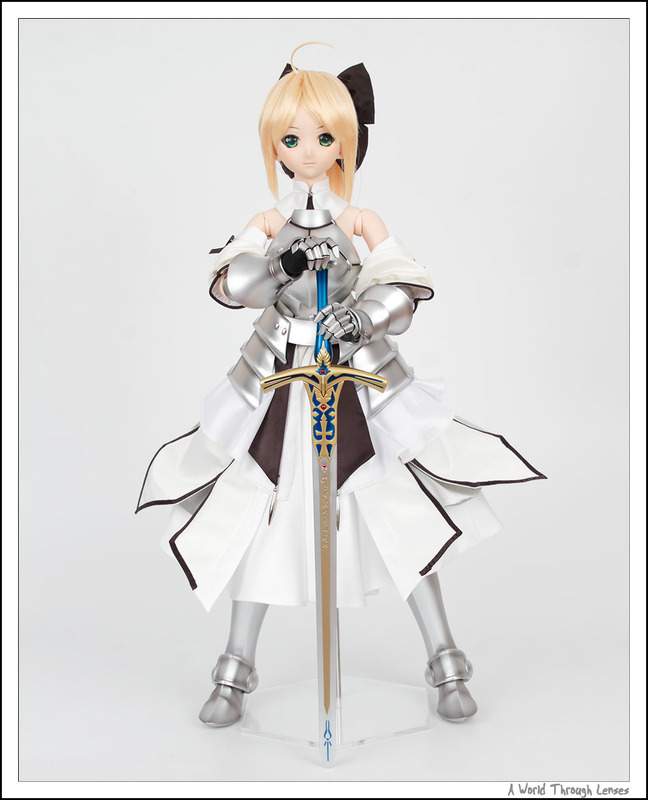 Believe it or not, I’m probably in the minority group that I actually liked original Saber’s head sculpture better. I personally found the old head sculpture to be cuter and more likable. While most people on the Internet seems to like this new more lady like sculpture. 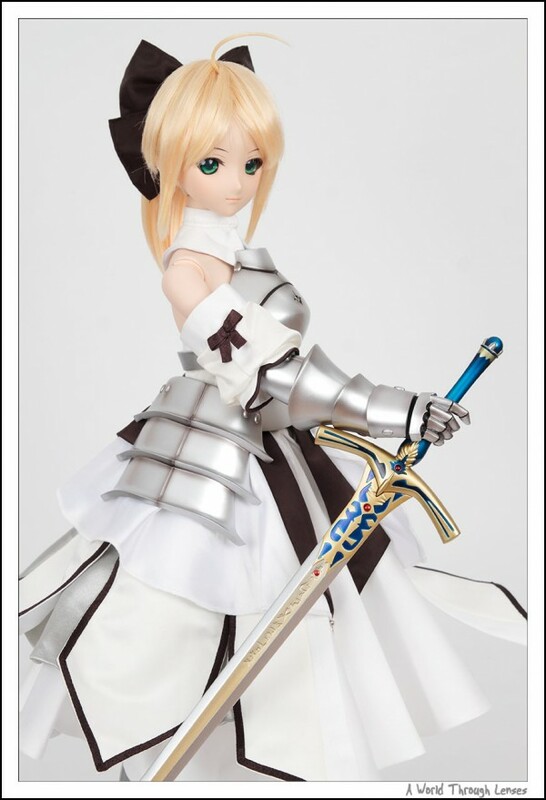 Yes this is more of an elegant head sculpture now, but for one reason or another, I like cuter faces and the original Saber with the wider face is simply adorable. 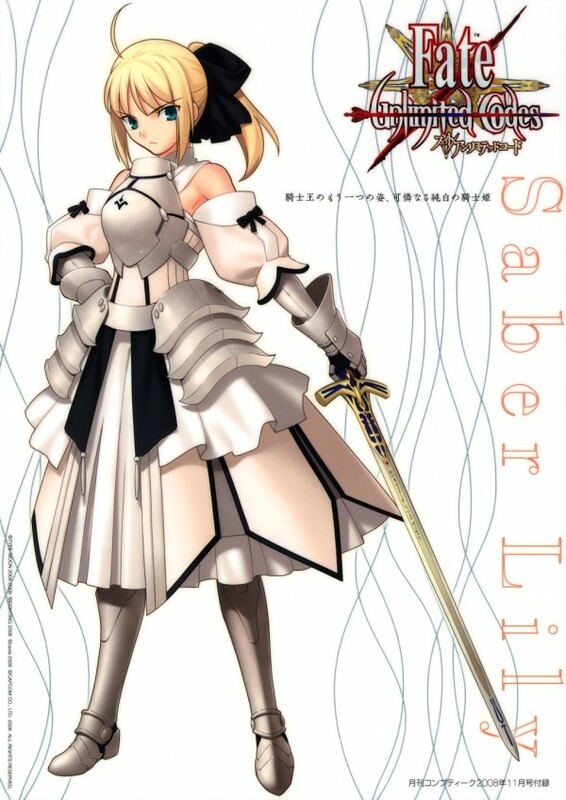 Here’s a 2D illustration of Saber Lily. 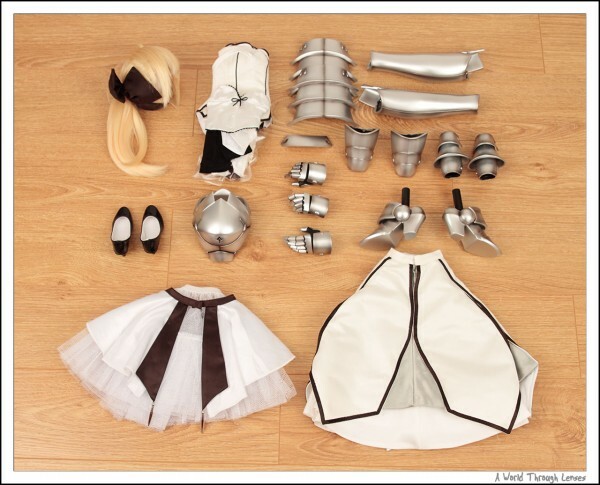 As you can see Volks really did a very good job of creating all the clothes and armor pieces for her. Nearly a one to one match down to the layer of clothes. There will be more Saber Lily posts following since she’s got so much more to offer. This is just to catch up the unboxing which should have taken place a week ago. 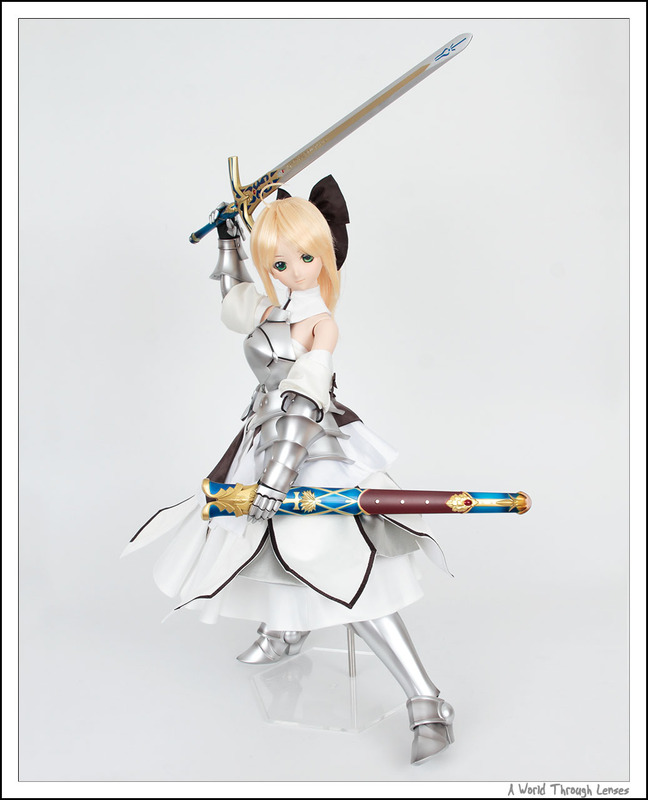 Nice photos, Saber Lily really is gorgeous, especially her outfit. Am quite fond of the head sculpt, might be tempted to graba head/body combo of her on YJA someday. Read quite a few messages of people whose Saber Lily wig broke near instantly, good though that Volks is diligent in replacing them. Wonder how long Volks will keep up with the wig replacement. I’d imagine for those whose wig is broken say a few month from now will be less fortunate and might not get as good of a wig replacement service from Volks as those of us today. Any tips on tying the stubby bit together again? Well if you got the doll form Volks, I would immediately contact Volks to get a replacement. Otherwise, I would still try I guess. If all fails, then you can do what I do. I take the wig off the head to make tie a bit easier. Then I just grab those hair that should form the stub and use a elastic string, I tied it, not all that neatly, but does form a stub. Use a elastic string helps, too thin of a string will lose grip easily and too thick of a string take too much space. Take a look at what Volks uses to tie the original stub. (I in fact just used Volks’ string that partly was still on the stub when the pony tail fell off.) Then I put the wig back onto the head for a better form. Adjust for some length and glue the tip of the hair together. Once you get it glued up nicely, I loosen the tie. Now I arrange the hair a bit more and then tie it hard. Then I added some more glue in the stub to make sure the stub is formed well. By now the hair won’t go loose any more. So it’s just a matter of put the ribbon tie back, and then stretch the hair net in the pony tail a bit and push it back onto the stub. Since the stub is glued together, it should be pretty solid and you can just push it back up. Then I pick up a few corners that’s not fully to the base and just pull it up to the base of the stub. It worked pretty well for me, not 100% like new, but I’d say very good. Yeah I did the same thing as you can see. I fixed it while waiting for Volks to fix the issue. 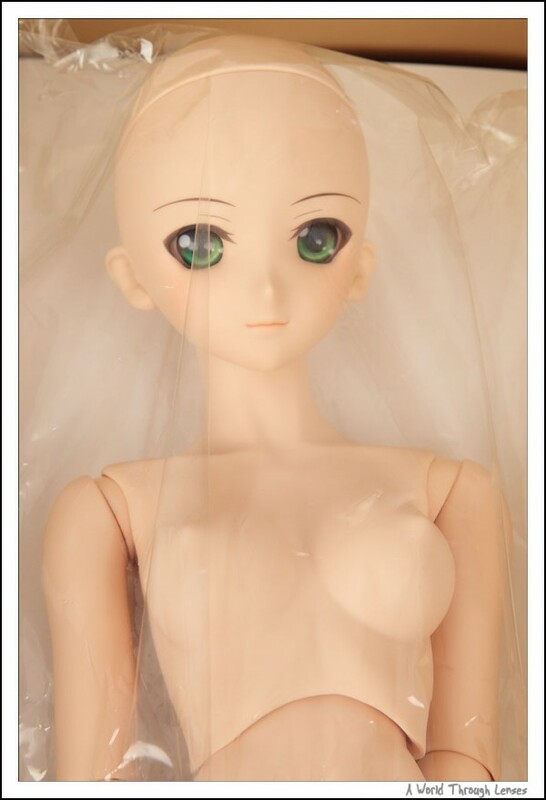 Now the thing is Volks will want you to ship the damaged wigs to them. So there’s really no point in fixing it until you exhausted all options with a fix from Volks. I bought from Lily from YAJ and because of that Volks basically told me they won’t help. My wig also instantly fell apart. It’s pretty shocking for such an expensive item really. Yeah glad that you got yours fixed. I was definitely a bit disappointed in the wig design. Although on the bright side, it is relatively easy to fix, at least I found it to be. And Volks is currently replacing all damaged wigs. I’m just surprised that Volks decided not to glue the pony tail in. Because a little glue would make all these problem go away. Good news – I just got my replacement wig and have been VERY gentle with putting it on (like I did before). Lily is now complete : ) Thank you so much for your advice! Good to hear that your wig issue is now resolved. 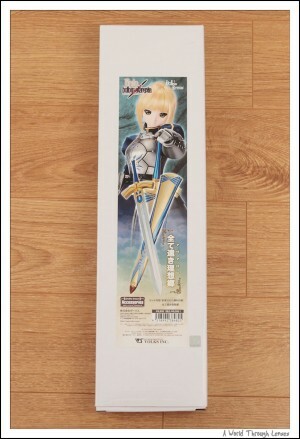 Well when you said you bought it form Japan DP, I’m not sure if you bought it directly from Volks International or did you buy it from the DP in person? Or did you buy it through a deputy, etc. I got mine through lottery from Volks International. So I basically contacted Volks International directly. They replied and sent me the replacement. That was over 4 months ago. I’ve also known that Volks USA has put a label on their Saber Lily indicating that the piggy tail is very fragile and user should never pull on it. 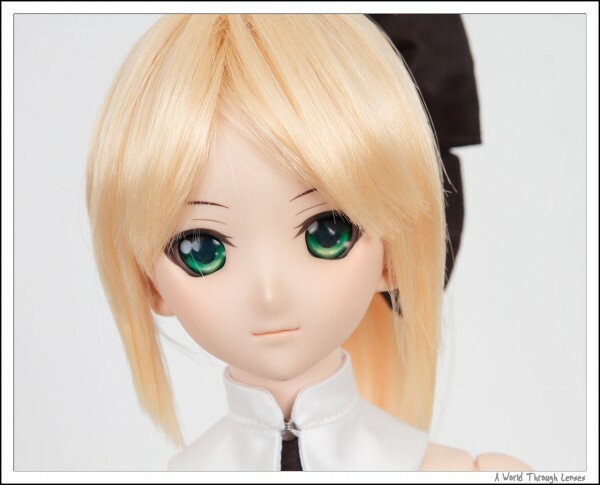 Volks USA has also indicated that they will not be offering any replacements in events of wig damage. Now more than 4 months later, I’m not sure if Volks International is still willing to offer any replacement assuming you purchased from them. But if you did won the lottery and purchased from Volks International, then I suggest you email them right away and see what they say. 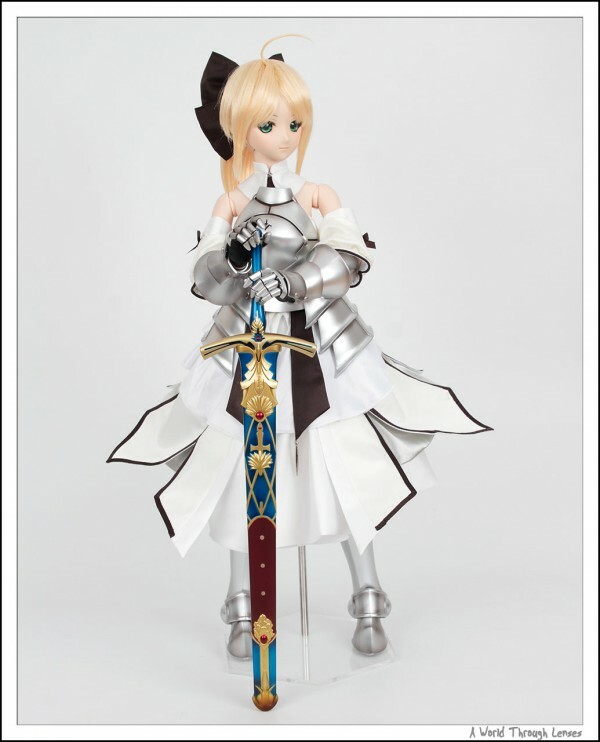 If you bought it either in person or through a deputy at the Dolpa in Japan, then you would have to contact Volks Japan directly and see if they are willing to help. 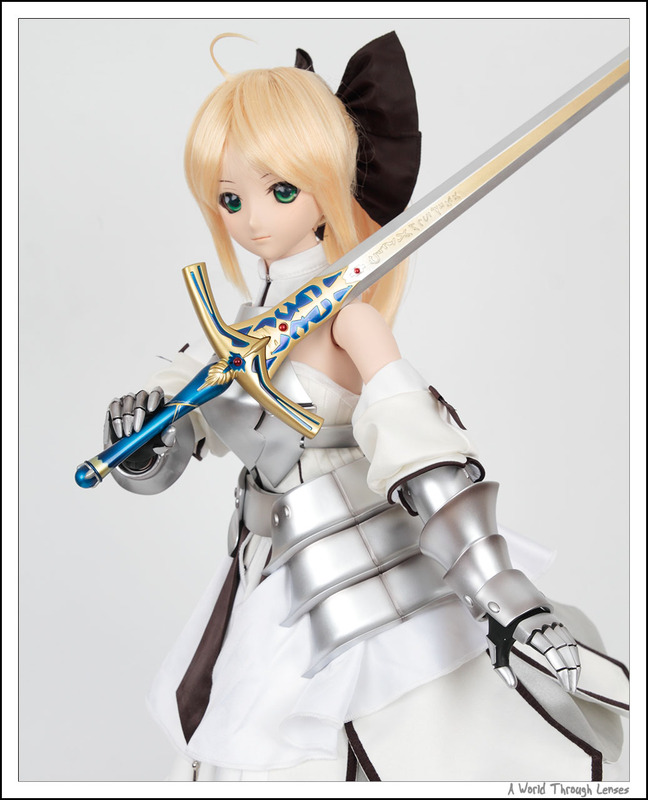 Of course to contact Volks Japan, I’m assuming you are okay with written Japanese.